Directions: Exit Tampa International Airport - Merge onto I-275 North (towards Tampa). Exit onto North Ashley Drive. Turn left onto Jackson Street - Take a right onto South Florida Avenue to hotel. Directions: Exit St. Petersburg/Clearwater Airport - Merge onto I-275 North (Tampa). Take a right onto North Ashley Drive. Turn left onto Jackson Street. Turn right onto South Florida Avenue. 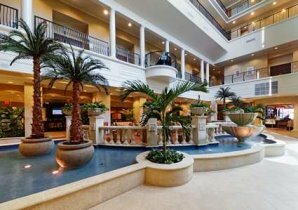 The 360 suite Embassy Suites Tampa ~ Downtown Convention Center provides a direct connection via our Sky-bridge to the Tampa Convention Center to ensure you're staying at the best hotel for all your convention center meetings and events. 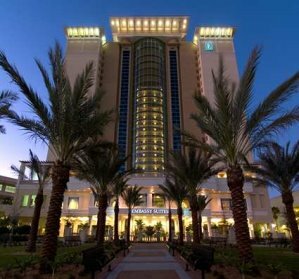 With each stay at our downtown Tampa hotel you'll experience Embassy Suites' famous complimentary cooked-to-order breakfast each morning and our complimentary Manager's Reception in the evenings. 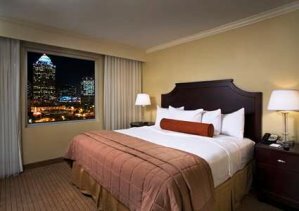 Our downtown Tampa hotel offers two-room suites, a roof top pool over-looking Tampa Bay and we're next door to the St. Pete/Times Forum for all Tampa sporting events, concerts and exhibits. The Tampa Cruise Port is also close by for all your Tampa cruise departures and we offer a great Tampa pre-Cruise Package. Downtown Tampa Florida offers something for everyone. Our downtown Tampa hotel is directly connected to the Tampa Convention Center via our own Sky-bridge for your convenience. We are next door to The St. Pete/Times Forum for concerts and sporting events. The Florida Aquarium is also within walking distance. Also downtown is Channelside where downtown Tampa's best restaurants, shops and movie theaters are located all within walking distance or you can ride the TECCO Trolley which is just steps out our front doors. Ybor City can also be reached via the Trolley for some old world Tampa Cigar Shops as well as more movie theaters, unique shopping destinations and a nightlife scene you'll not soon forget! We’re close to many Tampa Golf Courses, world famous Gulf Beaches, Lowery Park Zoo, museums and the Port of Tampa for cruise departures.